Political gridlock and a struggling economy have vaulted to the top of U.S. citizens' priorities. 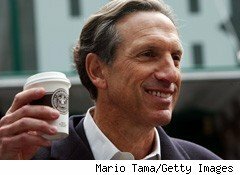 Now, Starbucks (SBUX) CEO Howard Schultz has grand plans to cut through the noise and remind our country's politicians of their problem-solving duties. On Tuesday, Schultz is hosting a gigantic, public telephone town hall at 7:30 p.m. (EST). He is reaching out to "concerned Americans" to join his movement and participate in the gigantic call-in discussion. Details about the town hall, which will also be viewable online, are available here. Schultz's public powwow follows another recent campaign to hit politicians right where it mattered: the wallet. Schultz publicly encouraged fellow corporate leaders to turn off the corporate political contribution spigot until politicians start solving problems. At the time, it seemed questionable that many corporate leaders would publicly take a stand on such an issue. As it turns out, a number of high-profile, respected individuals in the corporate community have signed on to Schultz's pledge, including individuals affiliated with well-known companies such as AOL(AOL), J. Crew, Zipcar(ZIP), PepsiCo (PEP), Whole Foods (WFM), and the NYSE and Nasdaq stock exchanges. Schultz is further galvanizing his push by running ads in The New York Times and USA Today. He has also formed the group Upward Spiral, accessible online and through social media sites like Facebook. Upward Spiral's site includes a Pledge to Withhold campaign contributions ("I believe this is a time for citizenship, not partisanship"), and a Pledge to Hire ("We want to set in motion an upward spiral of confidence in our country and its economy."). According to the Associated Press, Schultz's desire to take it to the streets, so to speak, relates to the outpouring of feedback he received in emails and letters from ordinary Americans who are struggling amid the current grim economy. "It looks like we struck a nerve with so many people," Schultz said. "I feel a personal responsibility to create a public dialogue and make a voice for people who feel like they can't be heard." Perhaps corporations' CEOs have little business interfering in politics. On the other hand, Howard Schultz is illustrating what real leaders do: They listen to the stories and situations that ordinary people share, and try to make a real difference for a better world. Starbucks' shareholders should be proud of such bold and noble intent. It takes guts to really try to make a difference, especially in such contentious and troubled times. Motley Fool analyst Alyce Lomax owns shares of Starbucks and Whole Foods. The Motley Fool owns shares of Zipcar, Starbucks, Whole Foods, and PepsiCo. Motley Fool newsletter services have recommended buying shares of Starbucks, Whole Foods, PepsiCo, NYSE Euronext, and Zipcar, as well as creating a diagonal call position in PepsiCo.